Power Discount LLP Blog | How do I know how many light fittings I need? You are here: Home » How do I? » How do I know how many light fittings I need? If you are remodeling a room and have the opportunity to replace your light fittings you might be wondering how many you need to put in. If you are looking to make the switch to LED how do you know what lamp you need to buy? How bright should your room be and how can that be translated into the lamps and fittings you are buying? Back in the days of halogen it was pretty easy to work out. Usually you would put 50w halogens in a kitchen, 35w halogens or bedroom and 40w GLS lamps in your bedroom. The brighter the room needs to be, the higher the wattage you would use in that room. LED has changed things, you can get better light out of a 3w LED than a 6w LED depending on the quality, beam angle and efficiency of the lamps and so we need a way to ensure that we have enough light output from our LED lamps. The amount of light you need in a room depends on what you are doing. We measure the brightness of the light in a room with illuminance (lux) and different rooms have different recommendations. The average illuminance in the home is around 150lux. Worked example of choosing lamps for the bedroom. So for a bedroom that is on the darker side of comfortable I will be using a value of 50 lux. So for lumens I need 50 x 12 = 600 lumens in total. That isn’t too bad at all, I can get 600 lumens out of 3 Crompton LGU103SMD 3W lamps (which have a wide beam angle – 90°, better for softer lighting) or some Aurora Enlite EN-GU1006 6w lamps (which have a smaller beam angle – 36°, more focused). If you wanted to go traditional halogen you could always go for 2 or 3 35w halogen lamps but at 10 times the power consumption and a fraction of the lamps life it just isn’t worth it anymore! Worked example of choosing lamps for the kitchen. The kitchen needs to be brighter, there are few things as frustrating as trying to cook properly in a poorly lit room. Everything becomes much harder! The recommended 300 lux is over 6 times more than our bedroom example and you might thing that we are going to need a lot of lamps! Lumens = 300 x 8 = 2400 lumens. That seems quite a bit more but kitchens do need to be brighter and there will be other light in the room such as possibly having under cabinet or over hob lighting. The Bell 05178 7w PRO LED dimmable lamps rate at 470lm each. 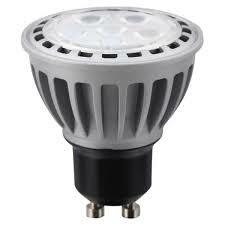 We also have the Crompton LGU105COB 5w non dimmable lamps that rate at 450lm This would mean you would need around 5 LED lamps to get that kind of lumen output for your kitchen. As these are retrofit lamps you can fit them in any GU10 fitting such as the spotlights we have available from KSR. So why not just use the wattage? Well hopefully you can see by the lamps above that the wattage isn’t always indicative of how much light you will get out of the lamps. The Aurora lamp (6w) is a higher wattage than the Crompton (5w) lamp but due to different LED technologies (standard vs COB) and beam angles (36° vs 45°) the lumen output is higher on the Crompton lamp. The lumen output is important. Most lamps will have a lumen rating on them which you can use to determine if it is bright enough. If you are really lucky, the lamps will have LUX on them and there is no conversion needed!